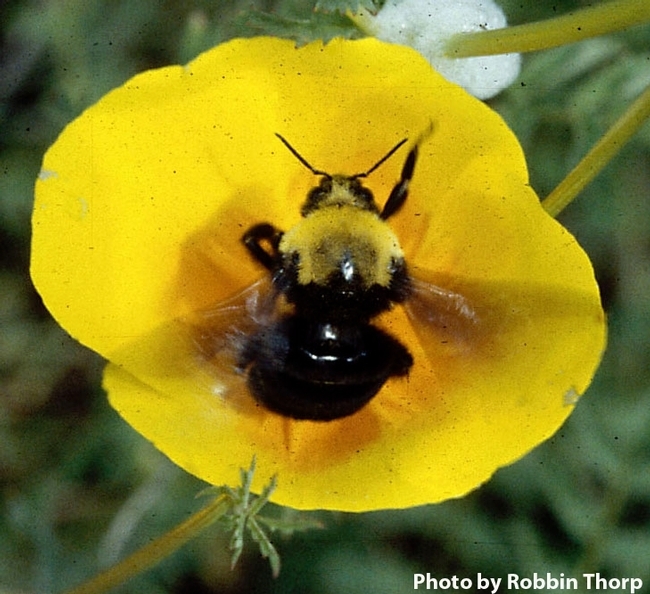 It's National Pollinator Week and you might be wondering where your pollinators are. 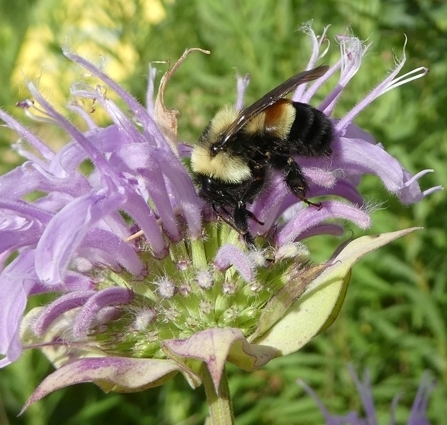 “I'd love to attract honey bees, bumble bees and other pollinators, but what can I do?" you ask. "Where do I start?" 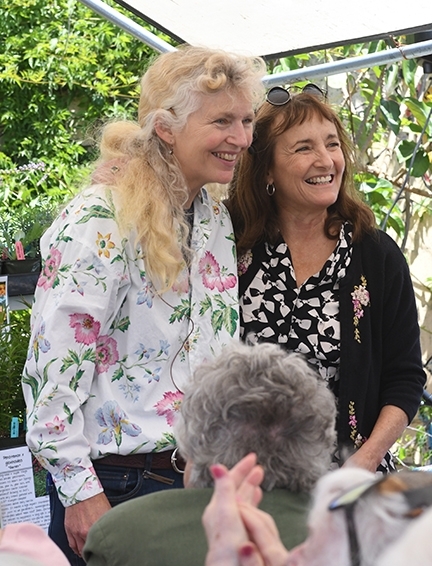 So we asked world-class garden designer Kate Frey of Hopland, a two-time gold medal winner at the prestigious Chelsea Flower Show in London, co-founder of the American Garden School, and co-author of The Bee-Friendly Garden (with Professor Gretchen LeBuhn of San Francisco State University) for her advice. 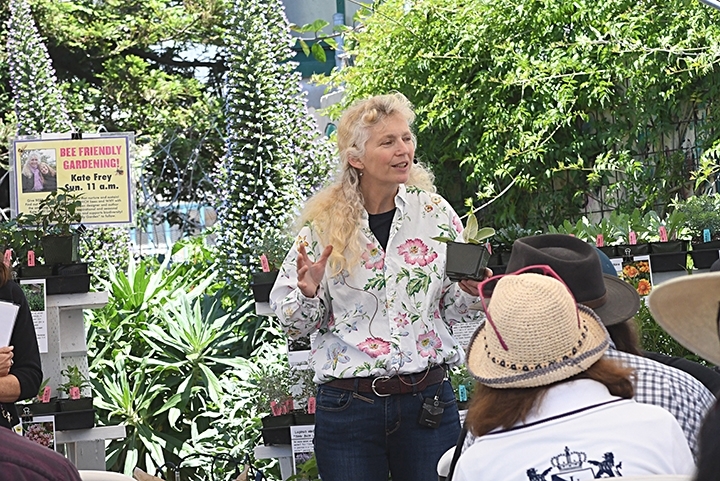 Few people are as passionate about pollinators and pollinator gardens as Kate Frey. 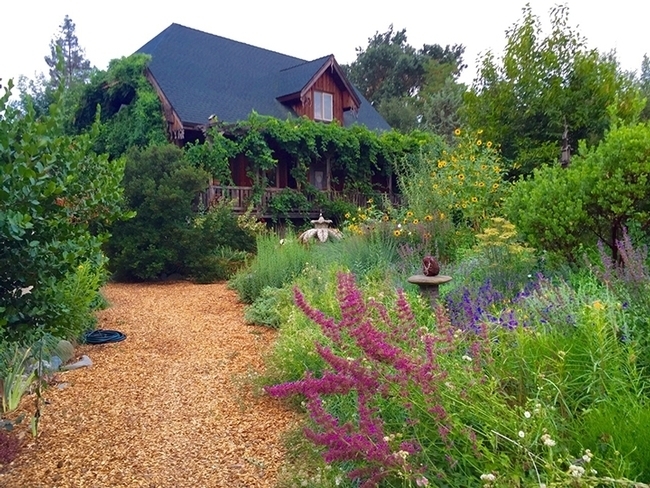 We heard her speak at the Native Bees Workshop last September at the Hopland Research and Extension Center, Mendocino County, and we tagged along on her guided tour of her one-acre spectacular garden at her Hopland home, where she and husband Ben and assorted pets reside. 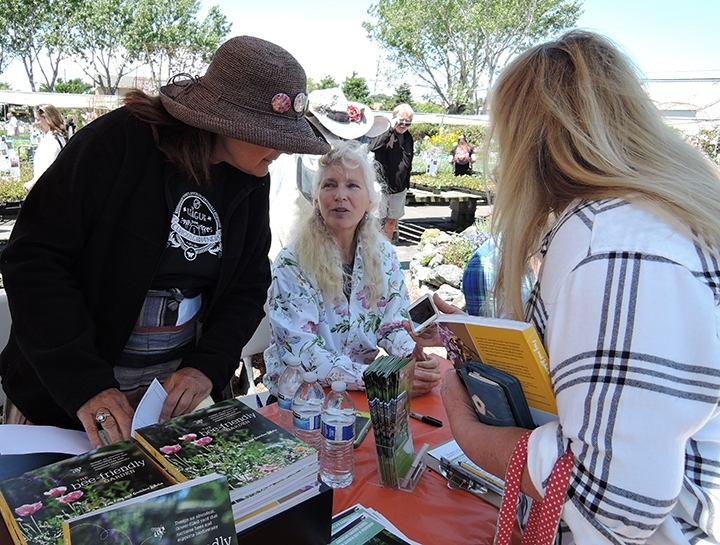 We also heard her speak on "Gardening for Bees, Beauty and Diversity" May 14 at Annie's Annuals and Perennials, Richmond. Create healthy gardens that require no pesticides by using the right plant, right place approach, add quality compost to all plants and irrigate adequately. Choose appropriate plants for your water, soils, exposure, climate, and if annuals, season! Think in terms of abundance, not minimalism. Plant at least a 3-x-3 foot area of each plant, or repeat the same plant throughout your garden. 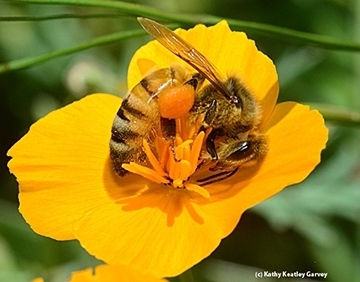 Each honey bee colony needs an estimated one-acre of flowers to support it. Goal: 12 months of bloom. Plants can be annuals, perennials, shrubs or trees. 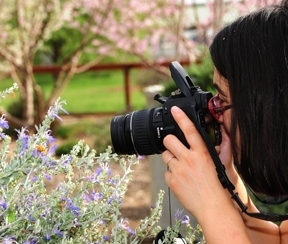 Make sure plants do offer floral resources, as many landscape plants don't. 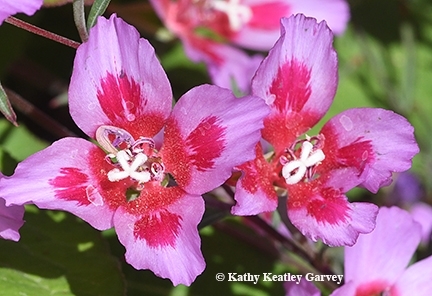 Have patches or repeated plants of the same flower. Honey bees practice floral constancy. Sunny spaces are the best. 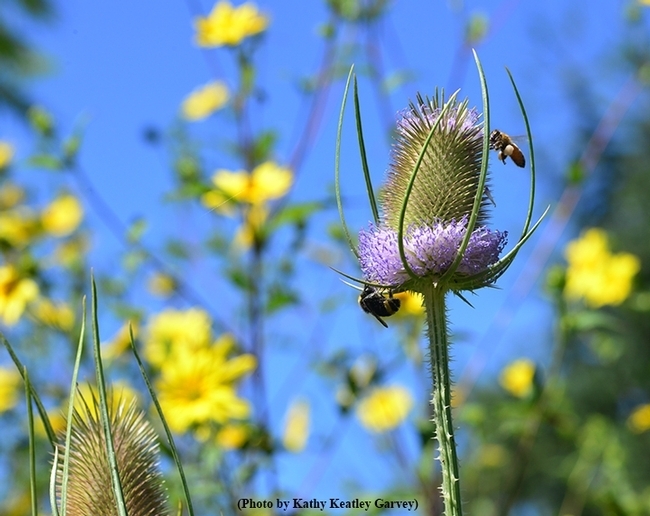 Provide bee-block nests and mulch-free nest sites for native bees. All great advice! 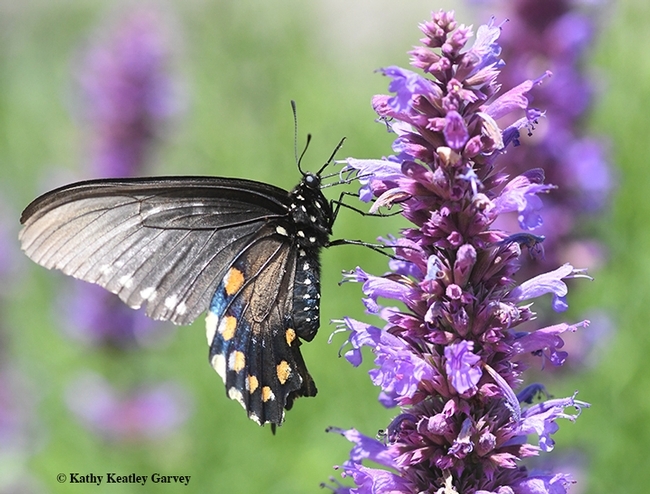 Indeed, we should think of pollinators as not mere "visitors," but permanent residents. Plant what they like and they will come. To ensure that they will stay stay, leave soil bare for ground-nesting bees, such as bumble bees. 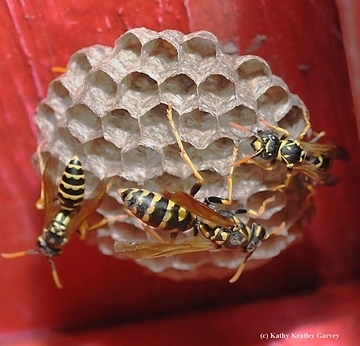 And don't forget those bee-block nests, or bee condos, for leafcutter bees and blue orchard bees. Origanum, flowering oregano, all. Origanum 'Santa Cruz' and 'Bristol Cross' are good. 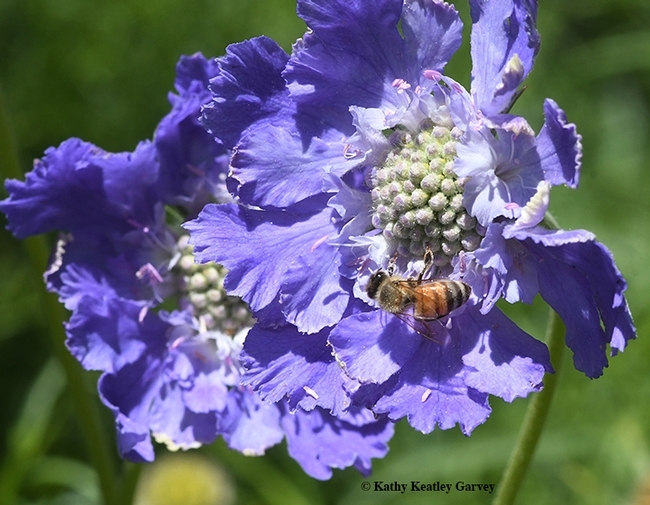 "Bee gardens make people happy," Kate Frey and Gretchen LeBuhn write in their book. 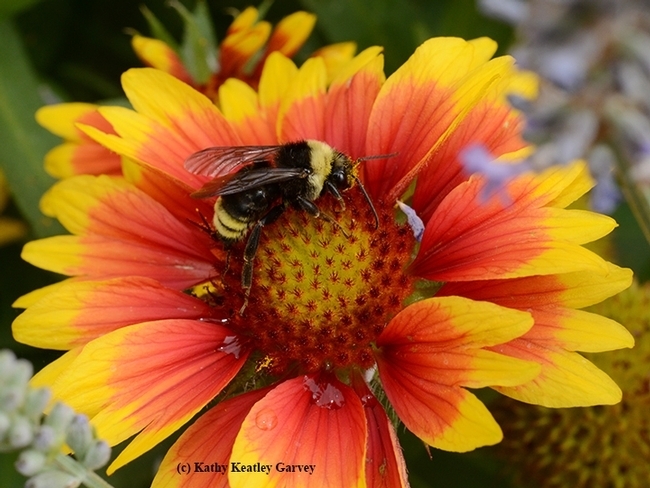 "Whether you enjoy a brilliant chorus of saturated color, a tranquil sanctuary from the busy world, or a hardworking edible garden, there is a glorious, flower-filled bee garden waiting for you." Yes, we all need a happy place. And so, too, do the pollinators. It's good to see all the focus on National Pollinator Week, as typified by UC Davis graduate student/native bee ecologist Margaret "Rei" Scampavia (at right) focusing on a male Valley carpenter bee. This is Xylocopa varipuncta, also known as "the teddy bear bee." 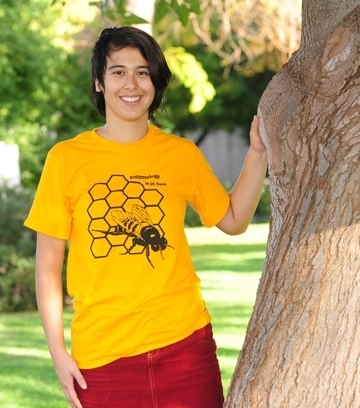 Scampavia, who is studying how farming practices affect bee nesting for her doctorate in entomology, recently won the top graduate student poster award at the first-ever UC Davis Bee Symposium, and provided the popular “Pollinator Pavilion” at the UC Davis Picnic Day. She urges us to all pitch in and protect the pollinators. Good advice. 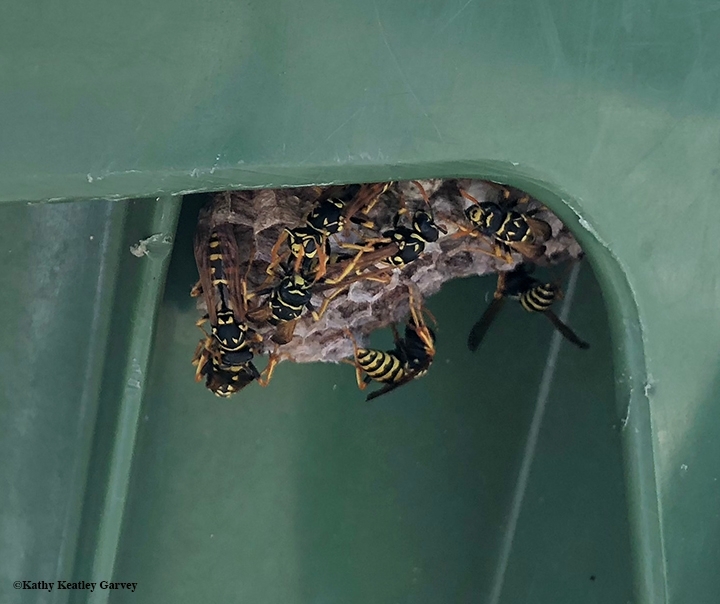 “Even if you only have a small balcony or patio, you can still provide food, nest, and pesticide-free resources for pollinators, including the 4,000 species of bees found in North America,” she says. Scampavia, who studies with major professors Neal Williams and Ed Lewis of the UC Davis Department of Entomology and Nematology and anticipates receiving her Ph.D. in 2016, lists three ways to “save the pollinators." 1. Provide food: Plant a variety of trees, shrubs and annual flower with blooms that differ in size, shape, color and flowering time. 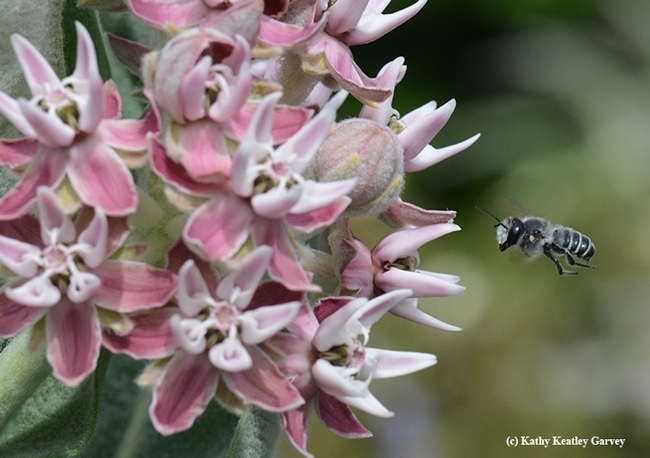 Planting native milkweeds also can help support monarch butterfly populations. Hummingbird and butterfly feeders can also provide additional food sources, but make sure to clean and disinfect your feeders regularly, as they can accumulate toxic fungi. 3. Provide pesticide shelters. 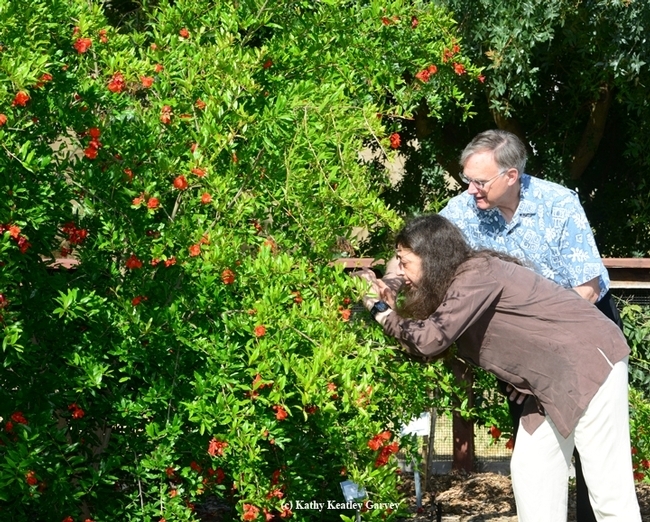 As much as possible, try to reduce pesticide use in your garden, or use less toxic pesticides, such as soap sand oils. 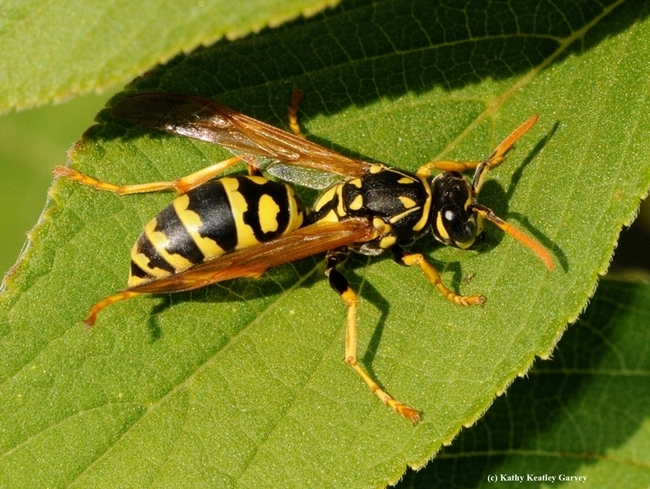 If you spray, do so when pollinators are not active--after dusk to before dawn. Try to avoid spraying flowers directly. Create a pesticide-free source of water and mud for bees and butterflies, such as a dripping faucet or a bird. 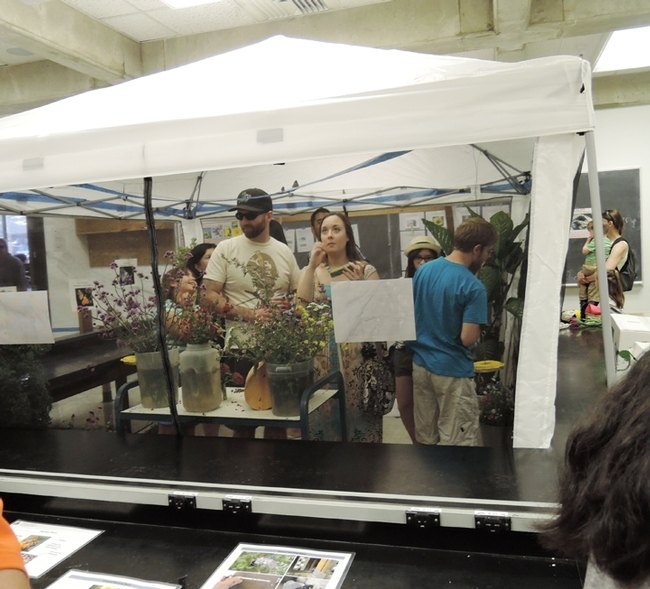 Scampavia launched the first-ever Pollinator Pavilion at the UC Davis Picnic Day. 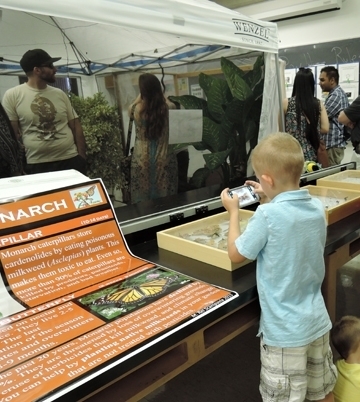 It proved to be one of the most popular attractions not only in the UC Davis Department of Entomology and Nematology display at Briggs Hall but at the entire UC Davis Picnic Day celebration. She displayed live monarchs donated by Utterback Farms in Woodland; butterfly feeders and bee condos donated by ARBICO Organics, based in Arizona; a live bumble bee colony from UC Davis research; and specimens from the Bohart Museum of Entomology, UC Davis. 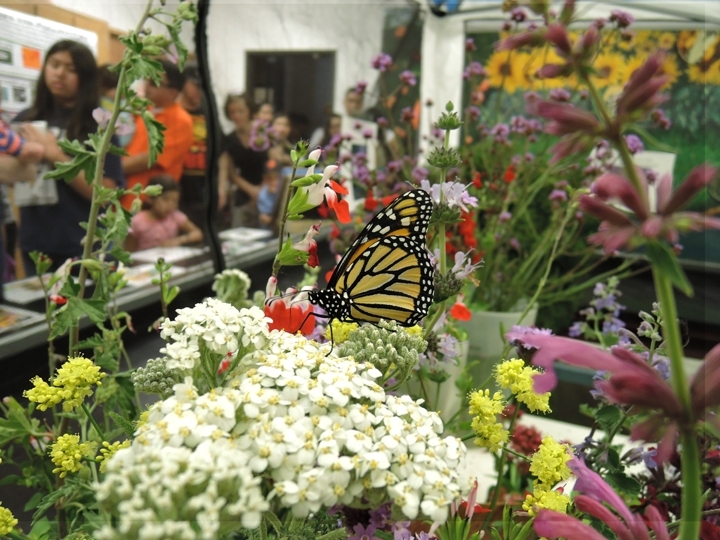 Her display showcased numerous live pollinators, including bees, butterflies and flies. She also drew in the crowds with informational posters on pollinators. 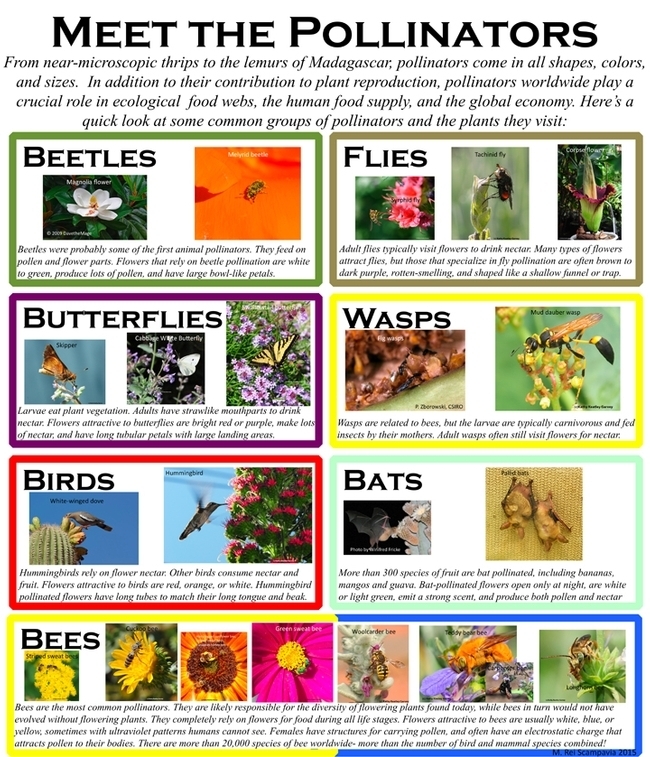 The posters detailed how individuals can help support healthy pollinator populations. 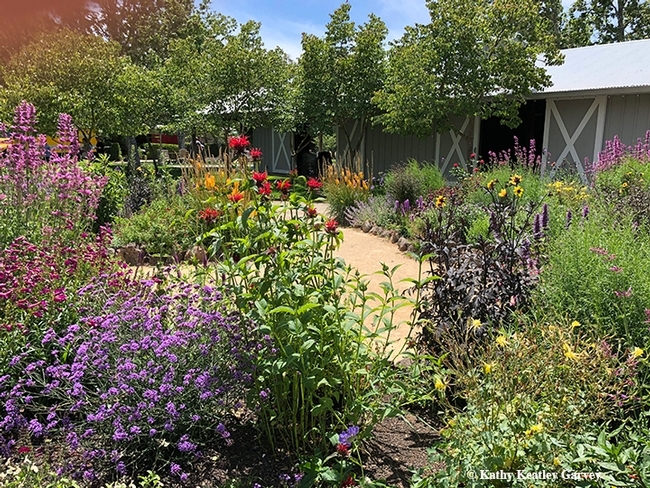 Visitors could walk inside the zipped enclosure and be one-on-one with the pollinators, including the monarchs, blue orchard bees, and syprhid flies. Many took photos of the monarchs on their hands or arms. 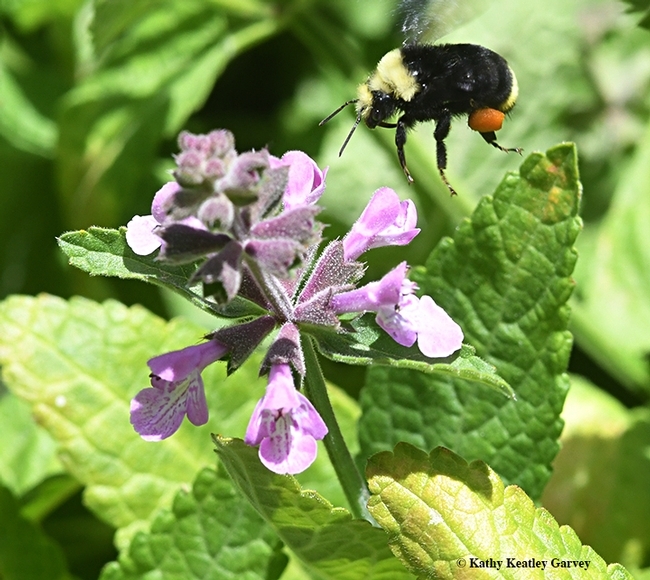 Younger visitors were encouraged to practice observing pollinators by filling out a data sheet counting the number of each type of pollinator they saw. 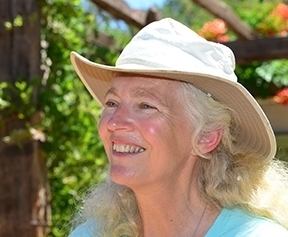 "Rei is mutli-talented: she is able to both conduct high quality research and communicate information about pollinators in engaging and effective ways," said Katharina Ullmann who holds a doctorate in entomology from UC Davis (Neal Williams lab) and is now a crop pollination specialist for the Xerces Society for Invertebrate Conservation. 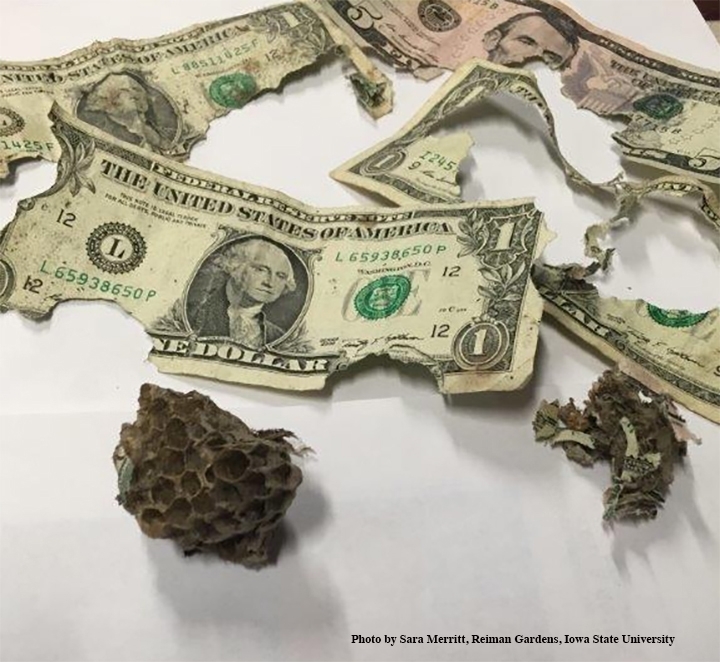 "Anyone who saw her award-winning poster at the Bee Symposium or who experience the pollinator pavilion at Picnic day knows that pollinators are lucky to have Rei working for them!" Scampavia received her bachelor's degree in biology in 2008 from Mills College, Oakland. She began her doctoral studies at UC Davis in 2011. She earlier served as a biological science technician (plants) for the U.S. Forest Service, Groveland, Calif., and ; a research consultant for BMP Ecosciences in San Francisco. 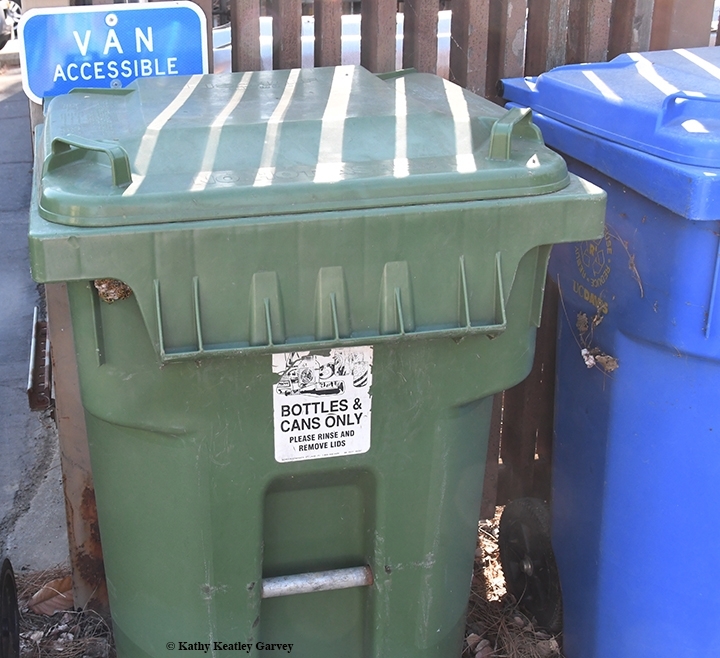 Active in the Entomological Society of America (ESA), Scampavia was a member of the 2014 UC Davis Student Debate Team that won first place in the nationals. She also was a member of the 2013 UC Davis Linnaean Games Team that won second at the annual meeting of the Pacific Branch of ESA. If you want to meet Rei Scampavia and "talk bees," she'll be volunteering at the Häagen-Dazs Honey Bee Haven open house from 5:30 to 7 p.m., Friday, June 19. 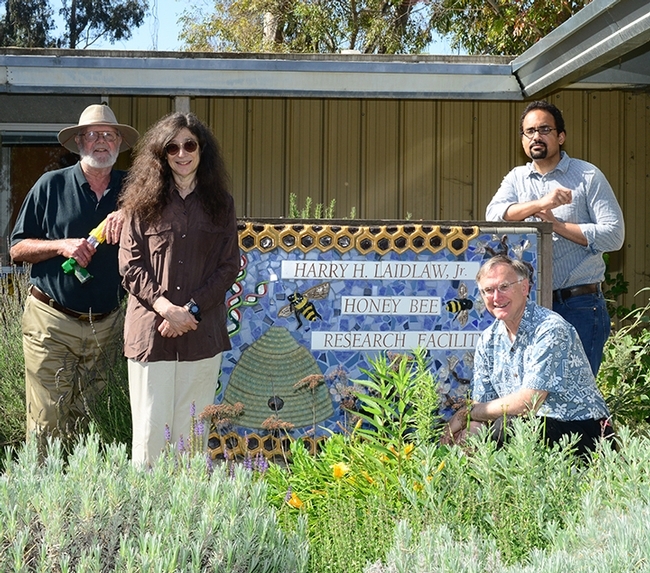 The haven, managed by staff director Chris Casey and faculty director Elina Niño, Extension apiculturist, is located on Bee Biology Road, next to the Harry H. Laidlaw Jr. Honey Bee Research Facility, west of the central campus. The half-acre bee garden, operated by the UC Davis Department of Entomology and Nematology, is filled with blooms, bees and butterflies! 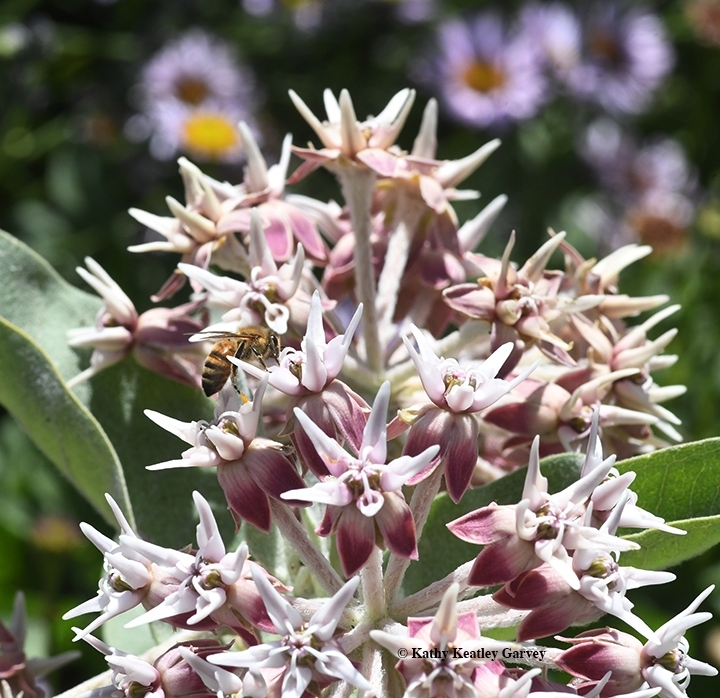 The open house, free and open to the public, will include bee observation and identification, honey tasting, sales of native bee houses to support the haven, and information about low-water plants. The garden is open to the public daily from dawn to dusk.